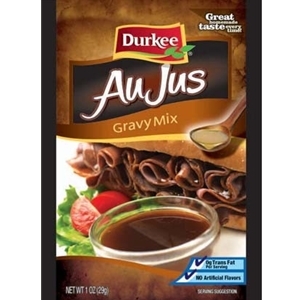 With water and less than 10 minutes of cooking, Durkee Au Jus yields a smooth and tasty gravy. 1 ounce packet. 1. Combine Durkee Au Jus Gravy Mix with cold water in a small saucepan. Stir until blended. 2. Bring to a boil; stirring constantly. 3. Reduce heat; simmer, stirring 1 minute until slightly thickened. Dextrose, Modified Food Starch, Salt, Hydrolyzed Soy Protein, Caramel Color, Dehydrated Onion, Hydrolyzed Soy, Corn and Wheat Protein, Dehydrated Garlic, Yeast Extract, Xanthan Gum, Disodium Inosinate, Corn Syrup Solids, Spices, Beef Extract, Beef Fat, Spice Extractive, Less Than 2% Silicon Dioxide added to Prevent Caking.